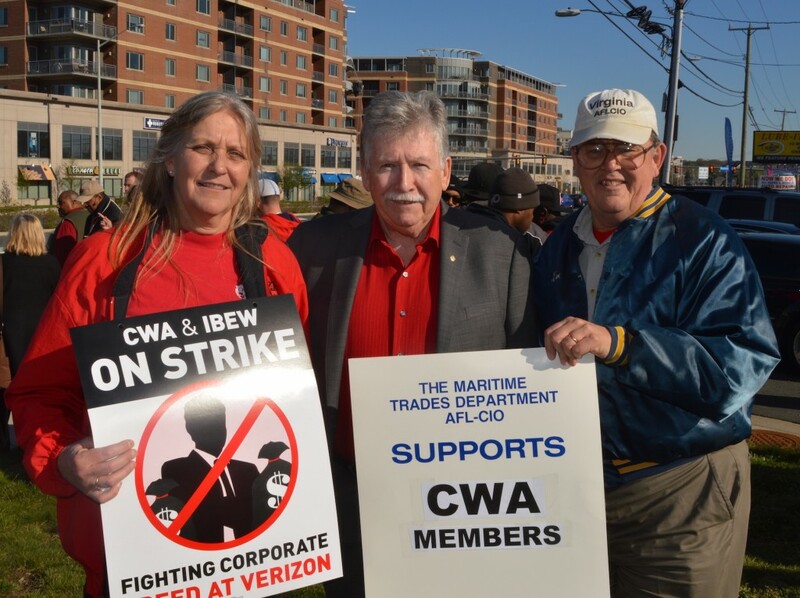 MTD Executive Secretary-Treasurer Daniel Duncan (right) shows solidarity with CWA Local 2222 President Carolyn Greenfield (left) and CWA President Chris Shelton during the first hours of the strike against Verizon. Verizon workers from MTD-affiliated Communications Workers of America and International Brotherhood of Electrical Workers hit the picket lines April 13 to demand that Verizon negotiate in good faith for a new contract. The unions have been meeting for ten months with the company, which has refused to consider any counteroffers. The strike affects nearly 40,000 union members from Massachusetts to Virginia. CWA President Chris Shelton addressed members of CWA Local 2222 hours after the lines went up outside of a Merrifield, VA location, vowing to continue the fight until they win. MTD President Michael Sacco declared the department will help the striking union members any way it can. Meanwhile, Verizon has enjoyed record profits. It earned $39 billion over the last three years, $18 billion in 2015. And in the first quarter of 2016, it made $1.8 billion per month. Verizon’s CEO, Lowell McAdam, earned $18 million last year – more than 200 times the compensation of the average Verizon employee. Verizon’s top executives made $232 million over the last five years, and last year Verizon paid $13.5 billion in dividends and stock buybacks to shareholders. While profits soar for top management, Verizon is demanding drastic cost shifting for retiree’s health care, slashing benefits for workers injured on the job, eliminating the corporate profit-sharing plan, drastically reducing health and retirement benefits, closing call centers and permanently transferring workers up to 80 miles away, and eliminating lay-off protection for workers hired before 2003. The company also is demanding changes to layoff procedures that would further diminish job protection. In addition, Verizon wants to expand offshoring of union jobs. It has already outsourced thousands of call center jobs to Mexico and the Philippines. Finally, Verizon also refuses to negotiate a fair contract for 100 Verizon wireless workers who organized into CWA in 2014.